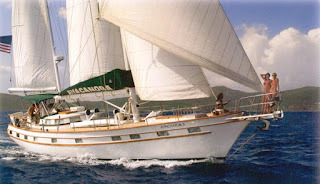 Special offer From Sailing Yacht Ayacanora. Take $2000 off the listed rates on charters occurring before 31 December, 2012. Cabins reconfigured, 2 equal Queen suites plus a singles cabin. Meet Rick Beckner (son-in-law), now the new Captain aboard Ayacanora and Roberta Haver, the Chef of which she has been for the last 16 years. Don't let your dreams sit on the shelf of life gathering dust. Come aboard Ayacanora. Named for the beautiful and willful heroine of the Charles Kingsley classic "Westward Ho!" she's a stunning 72 ft yacht with unique appointments. Ayacanora has a spacious area midships consisting of the main saloon and dining room is the epitome of well-appointed nautical style and grace. The sleeping accommodations offer two cabins with queen beds, couches, dresser , closet and ensuite bathrooms. A single cabin is also available for children with a separate bathroom. Click here for more pictures and charter availability.